Greetings, friends! I'm here today with the May edition of my monthly Embossed Elements feature on the DeNami Design blog. Today I'm preparing for Father's Day with a pair of cards featuring the very cool Diamond Plate Embossing Folder from the DeNami store. It's perfect for those sometimes hard-to-create masculine cards! My first card is a clean and simple one for Dad's Day. It uses just two DeNami stamps (Dad and Solid Block Border), two colors of ink (Habanero and Deep Lagoon), and two colors of cardstock. 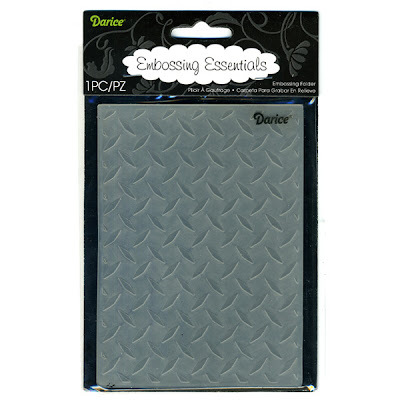 I used the Diamond Plate EF to emboss punched squares of cardstock. I love the bold, graphic look of this design. So easy to put together, too! My second card is a little more involved, but really not too much more. And oddly enough, it has basically the same sketch as the first one! That was totally unplanned, but there you have it ;). For this one I used the Diamond Plate EF to emboss a panel of vellum as a background for my card. I diecut a few gear shapes (perfect for a guy card, right?) that go with that diamond plate background perfectly. Once again I used just two DeNami stamps in my design (Happy Father's Day and Stitched Rectangle) and two ink colors (Satin Red and Onyx Black). This design is perfect for any mechanically inclined dads!! Thanks for taking a peek at my embossed Father's Day cards today. Be sure to take a peek below at my giveaway! I'll leave commenting open until 11:59 p.m. EST on Wednesday, May 28, 2014, and will draw one commenter at random. The winner will be announced right here on my blog on Thursday, May 29, and if I'm able to find an email address, I'll be sure to contact the winner as well. These are two perfect cards for the Guys! Love the diamond plate EF, and the use of the gears die cuts are a perfect addition!! Both are very cool guy cards. They are so hard to do and you got it just right. This is a great embossing folder perfect for masculine and graphic cards. You nailed it with both of these cards. Great guy cards! Those are always some of the hardest ones for me!!! I'm one who also has problems designing GUY CARDS - but your tricks have solved my problems and now I'll make up several for my great grandkids to give their dads! I'd love to win that folder to complete the cards dear. :) Thx LW. I follow you by email and also on blogspot! Linda W.
Great cards for guys, Emily! I love the texture an embossing folder adds to a card! I am already a follower here and follow through Google Reader! Fabulous set of cards for the guys in your life. Love that EF and the cogs are just too fun! Already a follower via Feedly :) Have a great Memorial Day! Fabulous 'guys' cards, Emily! I especially like the one with gears, and how coincidental that you had similar layouts for both! Wonderful "guys" cards! Love all the embossing! Emily these are BOTH perfect guy cards, you nailed your special feature again!!! But hey...there was never any doubt that you wouldn't! Love the card and this die would be great for all the guys in my life. I follow your blog through Bloglovin'. Thanks! I am not trying to win the embossing folder. I just wanted to say that I really like the simplicity of the first card and I am not usually a fan of a CAS card, but that card really strikes me. I love both your cards for Guys, Emily! Wonderful use of that neat DF! I'm a follower of your blog using Feedly. Both these cards look wonderful my friend. Love the die you used. Its perfect for a card for a man. Awesome Guy Cards! I always need new ideas for Guy Cards and I love this embossing folder. It screams Tool Box to me! Lol. Thank you for your generosity! I follow you here on your Blog. I have to tell you that your first FD card is simply wonderful!! Very bright and uplifting. I agree you second card is great for dads who love mechanical things! I also like how 2 of the embossed edges on each diamond appears whitish. Emily, these are SO AWESOME!!! Perfect masculine cards!!! !